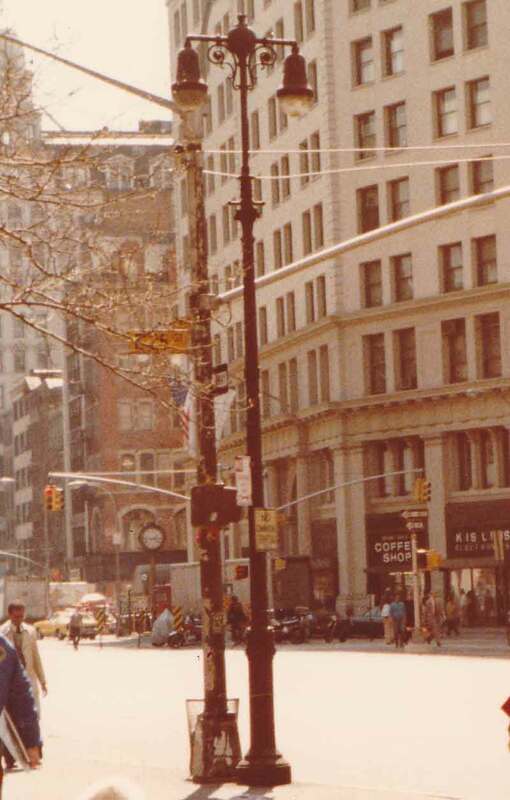 Three of the several old cast iron twin lamp lampposts that still inhabited lower and midtown 5th Avenue well into the 1980s, and perhaps still to this day. 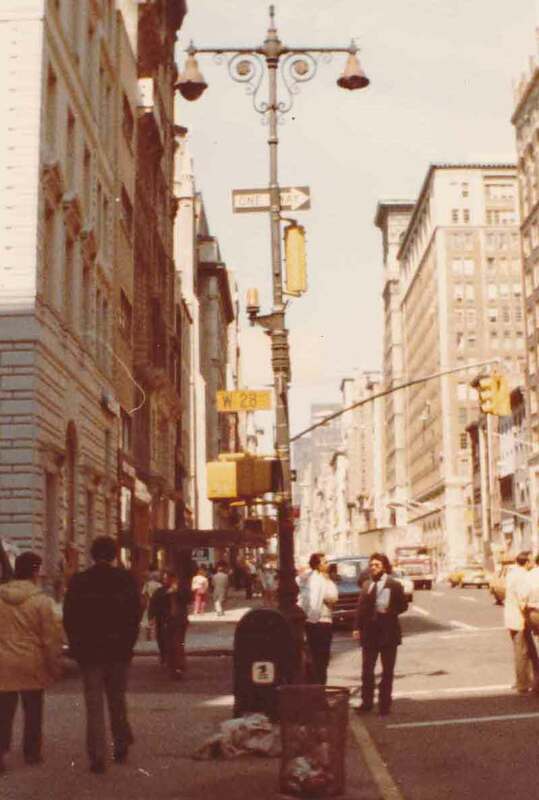 Having moved years ago to North Carolina, I no longer know exactly what's on 5th Avenue at this point, but I imagine most of these ancients are still there, having actually been landmarked for preservation. The first shown here is the oldest, at the corner of 5th Avenue and West 25th Street, alongside Madison Park. It dates from the previous turn of the century, possibly even dating from the 1800s, although I figure it is more likely of World War I vintage. It would have originally had elaborate finials at both ends of the mast arms, either balls, arrows or similar finial type decorations. Its original lamps would have hung pendant style from drop extensions fitted into the mast arms before the end. This one lost its decorative edges sometime in the 1930s or 1940s, when it was retrofitted with Bell shaped fixtures attached to simple elbow joint connectors, which edged the finials out of their job. The top part of this pole is what was known as a Type 3 twin arm. Over the years various combination of mast heads and pole standards got intermixed, but this one appeared to have both its original configurations. This particular lamppost no longer exists. Apparently it was removed within a few years after I took the photo. 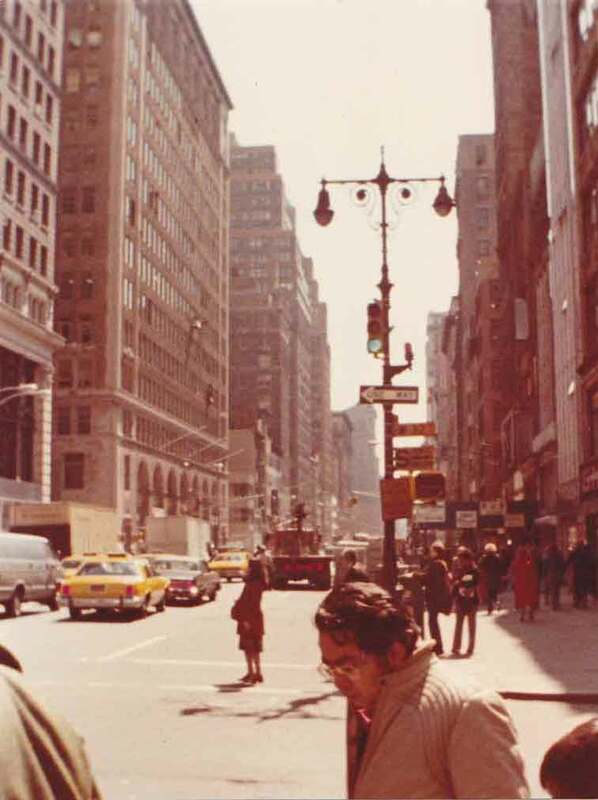 Three blocks to the north at West 28th Street stood a later generation twin lamp, sporting two early 1950s ear Westinghouse fixtures I dubbed the Cuplights. The poor lamppost looks a little asymmetrical due to one of the luminaires missing its diffuser bowl. Happily, according to the latest revision on Kevin Walsh's Forgotten NY Twin Lamp Page, this pole, and I assume the next one four blocks to the north, still survive. Even the missing diffuser bowl was replaced. This lamppost had a full plate on its hands too. Not just an aging relic acting as a street side museum piece, this twin lamp cast iron had to work for a living. 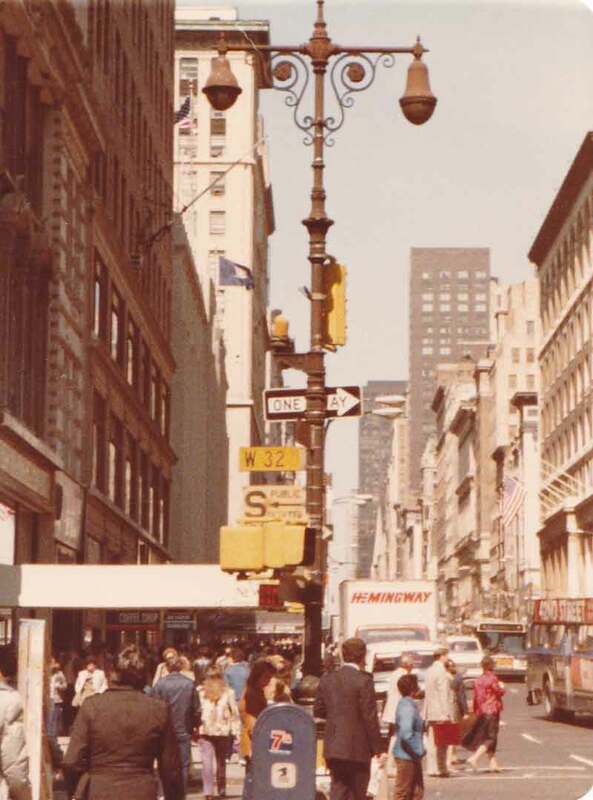 As of 1982, it had to hold a one way sign, traffic light, a pair of heavy walk signals, the corner street signs, and last but not least, the little orange light informing passersby that a fire alarm box is at the corner. I'm taking it on faith that the twin lamp pole at the corner of West 32nd Street still survives into 2012. These photos were taken 30 years prior. This pole has an even heavier load to carry than its equally asymmetrical brother to the south. In addition to a traffic signal, walk signals, street corner signs and fire alarm beacon, this one also had a miscellaneous traffic warning sign and best of all, a nuclear bomb shelter sign. Yeah, I know that sounds funny in this day and age, but whenever you see such a sign, remember where it points to. We're not out of the woods yet by any means on that count. Just don't go into such a shelter expecting fresh canned food to be on the shelves. More likely you'll find old rusting relics from the 1950s. The first view at West 32nd Street faced south. The second one looks northward at the oncoming 5th Avenue traffic. Back in days of yore, the 1940s and such for me, 5th Avenue was a two way thoroughfare. All the major north south avenues eventually were converted to one way routes to supposedly ease traffic. I'm not sure any regular driver through Manhattan would ever feel the dubious benefit. I can't stand driving in Manhattan. I don't even like driving in Uptown Charlotte, preferring to ditch my car in Pineville and take the light rail in. New Yorkers don't know from light rails, or Pinevilles. They have a subway. This pole was probably feeling quite unbalanced due to the Bell and Cuplight luminaire combination. The Bells I imagine were probably cast iron, while the cups must have been steel, perhaps later aluminum. By the 1950s, if a Bell fixture failed, it was "coytins", as some New Yorkers might have pronounced "curtains", meaning you're dead. Until the advent of the mercury vapor cobra heads in the late 1950s, the replacement du jour would have been a Cuplight. Save for extreme rarities, cast iron poles in New York City were never fitted with cobra head fixtures. Perhaps the mast arms were considered too fragile to hold the weight of the horizontally extended fixtures. Anybody know if the Hemingway company represented by that truck still exists?